Aquatic, the world leader in innovative and inspirational bathware, today announced that many of its most popular, ADA-compliant, gelcoat, FreedomLine showers now include engineered, pre-leveled bases –- an enhancement that vastly simplifies installation, improves product performance and durability, and provides an even better bathing experience for consumers. 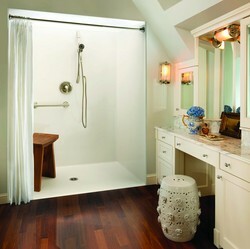 Many of Aquatic's most popular, ADA-compliant, gelcoat, FreedomLine showers now include engineered, pre-leveled bases. Our work to resolve the inherent challenges related to proper installation of ADA-compliant, accessible shower bottoms is another example of Aquatic’s commitment to customers and advancing the bathware industry through innovation. Aquatic, the world leader in innovative and inspirational bathware, today announced that many of its most popular, ADA-compliant, gelcoat, FreedomLine showers now include engineered, pre-leveled bases -– an enhancement that vastly simplifies installation, improves product performance and durability, and provides an even better bathing experience for consumers. Formed from the January 2010 merger of two industry giants – Lasco Bathware and Aquatic Whirlpools, Aquatic is renowned for standard-setting design and engineering as well as the industry’s largest catalog. The company’s offering includes a best-selling, accessible product line popular with hospitals, retirement and assisted living facilities, hotels, universities and colleges, military bases and multi-family housing projects. Typically, ADA-compliant accessible showers produced by virtually all bathware manufacturers require extra steps to ensure proper installation and to avoid potential pitfalls such as front threshold bowing and improper water drainage. Ironically, these challenges stem from ADA’s standards for accessible showers. To comply with ADA guidelines, an accessible shower must have: 1) a low profile threshold for easy entry and exit by a person with limited mobility or in a wheel chair; and 2) sufficient slope in the shower floor to allow for proper water control and drainage. These requisite product characteristics often make achieving level and rigid installation difficult, necessitating the use of foundation materials and brackets for optimizing shower unit performance. Now, building and plumbing professionals installing Aquatic’s showers with pre-leveled bases do not have to employ these compensatory fixes (assuming level floors at installation sites). They can follow much simpler manufacturer instructions for installation, saving both time and money. Users, too, will enjoy a more durable, longer lasting product. The new shower bottoms are made from high density, rigid, closed-cell polyurethane, encapsulated in reinforcing fiberglass. The reinforcement material conforms to the slope of the shower floor, and the sandwich construction significantly strengthens the base. The solution reduces the potential for bowing, poor drainage and related damage. Aquatic is the world leader in bathware and shower products. Born from the 2010 merger of Lasco Bathware and Aquatic Whirlpools, Aquatic offers the broadest and most inspiring selection of more than 300 luxury hydrotherapy, everyday and accessible bathing products. Based in Anaheim, California, Aquatic serves distributors, builders, architects, designers and consumers through a nationwide network of state-of-the-art facilities for manufacturing, distribution and support. For more information, visit http://www.aquaticbath.com.